Rated 5 out of 5 by senevabu from Awesome & Challenging I absolutely, absolutely! love this series. Figuring out how to achieve the goals is very challenging and forces you to visualize, which improves creativity. What would make this series even more fun, creative, and challenging is if the developers would allow us to change the orientation of the buildings and put in a relaxed mode (so I can figure out what configurations meet the goals). The timed mode would then be less frustrating. More element(s) that would give between 1 and 9 points and/or money would also increase the challenge; figuring out how to use those bonus elements to increase eco points or money. Maybe you could include some items where the gamer chooses how much money and how many points some items will cost/dispense would increase the challenge. I own two of this series and intend to purchase the last soon. Thank you, developers for this series!! Keep up the good work! Please consider my suggestions to improve an excellent series of games. If you incorporate some of those suggestions and even improve them to your own specifications, I can see this series continuing to be very popular. I guess the only thing I don't like about this series, is that there are not enough elements to generate varies levels of income and eco points. The items used to reach the goals, I feel, are very limited. Some elements that span the cost of items and that vary the income/eco points would be very helpful. Rated 5 out of 5 by Gipper from Addictive! You need to use the right strategy to pass each level. I loved playing again to make sure I finished within the time limit for a gold final score. But if you don't like timed strategy, no worries: you can play at your leisure. Fun fun fun. Rated 5 out of 5 by notdeadyet from It made me think. This is not an easy game but it is really neat. 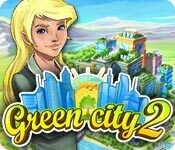 I have finished Green City and Green City 2 . I hope there is a Green City 3 on the way. I got stuck on some levels but the forum was very helpful.The strategy and graphics are good. I have arthritis in my hands but that was not a problem here. I was allowed to finish.The game was a satisfying length as well. Rated 5 out of 5 by DrDavid from Successor to Green City Green City 2 is very much like its predecessor and is as much fun. Like the original, the game is all fantasy and not instructional because nothing in the energy management or ecology is actually reality based, but within those imaginary rules it can work. I played it in untimed mode and found that much of the time I was tearing down buildings once or twice to fit the puzzle pieces and achieve the desired results. It was a challenge but a fun one. I felt good to “win” by finishing a level. 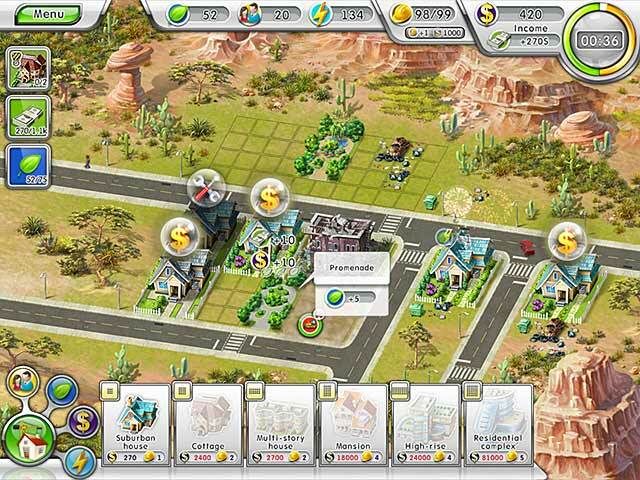 This is a building game with several different categories of accomplishments which have to be met to win. Each level is different and has different goals and requires different strategy. Rated 5 out of 5 by Eunice_PR from More challenging than the first! I love the Green City series. Turning run down towns into eco-friendly cities is a lot of fun. 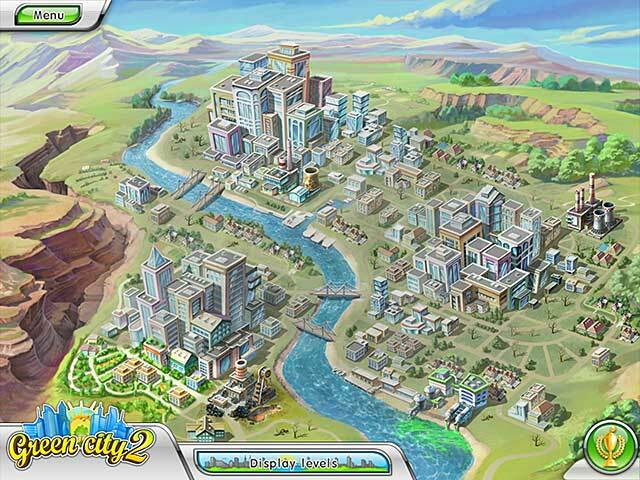 Green City 2 is a more complex version on the first Green City. 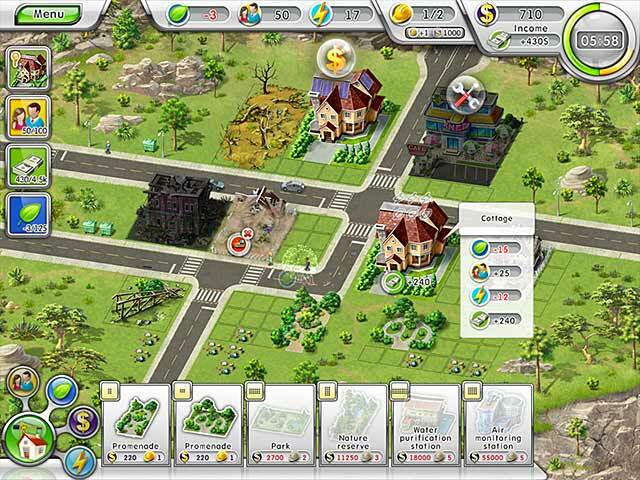 I flew by levels in the first games, but in Green City 2 I had to start developing strategies by level 21. I highly recommend this game. Rated 5 out of 5 by gold111z from Excellent & challenging tm/strategy game I love the fact that this game was a challenge. It bugs me when a game is too easy. Highly recommend! Rated 5 out of 5 by laplatz from Great Game This is a great game, couldn't stop playing and spent quite a few hours lost to the world, immersed in finding the right lay out AND getting gold score time. I still haven't succeeded in getting gold in every level. Will be buying Green City 1 too. Rated 5 out of 5 by boofycat from Strategy at its best Finished this game after a week of tearing my hair out! It is a true strategy game, especially after L23. Thank goodness you can continue after the time runs out as I only have gold on six levels so far. If you want a game that really makes you THINK instead of a click fest try this, you wont be disappointed.